A: Numerous studies and research has been completed on the effects of solar screens versus the other types of shading products. The studies have been completed by University of Florida,University of Texas, University of Arizona, U.S. Dept. of Energy, and the Florida Solar Energy Center/ University of Central Florida. Solar screens are by far the best way to block the sun from entering your windows and doors per the University of Florida study. Solar screens will block most of the sun’s rays from hitting your window glass and eliminating heat gain. The more heat gain you reduce in your home or office, the less your Air Conditioner will have to work, the more your air conditioner is not running it helps to prolong the life of your Air Conditioner. Blocking the ultra violet rays is essential to power savings and reduced wear on your mechanical equipment. A: We accept Cash, Check and all major credit cards. Q: Can we remove our sun screens in the winter? A: Yes. 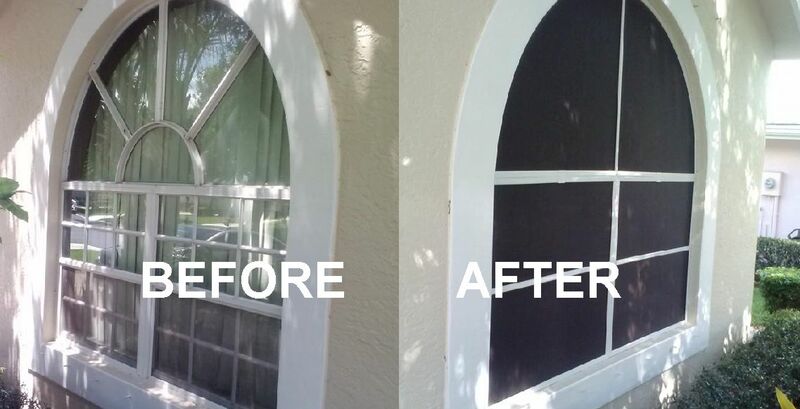 Either the homeowner can remove the solar screens, or ruce’s Cool Sun Screens will remove them for a small fee. One of the many benefits of solar screens as opposed to window tint, or film, is that the solar screens can be removed in the winter months to capture the sun’s heat. Q: Do we need our Homeowner Association approval? A: You may. If your home is part of an HOA, you may want to submit Solar screen samples and brochure for approval prior to fulfilling your order with us. Historically, HOA’s have been quite receptive to the energy savings solar screens can bring to the homeowner. Q: Will Bruce’s Cool Sun Screens block golf balls? A: Yes. We will guarantee against window breakage due to golf balls if we are allowed to install the screens on the face of the wall as opposed to a recessed installation against the window. Q: How will sun screens affect the appearance of the outside of my house? A: In many instances solar screens will enhance the appearance of your window openings from the outside. Due to solar screens, people are unable to see the different types of interior window treatments used to try to stop the sun and heat gain. With the right color combination of frame/ screen – the appearance of all window openings will be improved greatly. We have found that the overall aesthetics of the home has improved, which in effect appreciates the value of your property. Q: Can Bruce’s Cool Sun Screens install solar screen material on our lanai? A: Yes. We can install solar screens on your lanai or enclosed porch area in one of two ways. We can use your existing extruded frame, remove your old insect screen material and install our solar screening. The only drawback to this method is the inability to remove in the winter months; however it is more cost effective for the homeowner. The other option is to fabricate frames and install at lanai or porch area. Q: What size frame and hardware do you use to fabricate your solar screens? A: We only use 1″ x 5/16″ roll-formed aluminum frame stock. We miter all frame corners and use inside aluminum corners pieces to connect the frames together. The frame stock and hardware Bruce’s Cool Sun Screens uses it the best in the industry. Inside aluminum corners are superior to outside plastic corners because plastic corners succumb to the sun’s UV rays after a few years and deteriorate leaving the screen weak and possibly damaged beyond usefulness. Q: How much money can I save on my utility bills? A: The results for each home or building will vary, studies indicate a home or building having all sun struck windows shaded, can produce a savings up to 50% or more on cooling costs. Since windows account for almost 50% of the cooling cost of your home (more than the roof, walls, and attic COMBINED), it only makes sense to treat these areas with the most proven, cost effective, efficient, window treatment on the market today. At today’s energy prices, the savings are substantial, and the screens quickly “pay for themselves”. Return on investment is spectacular! Q: What kind of solar screens does Bruce’s Cool Sun Screens install? A: Bruce’s Cool Sun Screens only installs Phifer brand solar screens and shades. Phifer has been in business since 1952, and is the largest and most well known brand in the industry today. Do not be fooled by other companies trying to sell another brand of solar screen. Many other brands were originally designed for outdoor patio furniture, not for solar screens. Do not be fooled, insist on the best solar screen on the market today: Phifer brand solar screens. Phifer is the only material on the market that is “pet resistant.” No other solar screen manufacturer has the confidence in their product to make that claim. Q: How much do solar screens cost? A: Solar screens are considered by many, the most cost-effective, enhancement you can make to a home or building, for the money. Bruce’s Cool Sun Screens can measure, professionally build, and install the average sized solar screen for around $105/ window. Many people consider “window replacement” as a money-saving enhancement to their home/building, but starting at $500 per window requires many years in the home to “break even”, and the new “window replacement” still may not be as effective in controlling the sun’s heat and glare as the $105 solar screen. Even today’s new “high performance” windows can greatly benefit from solar screens. Q: Will installing solar screens negatively affect my window warranty? A: Solar screens will not affect any portion of your window warranty. Window manufacturers of double pane windows have indicated they may void your window warranty if a window tint or window film is applied. Tint or film can cause excessive heat to build between the panes of glass, and cause the seal between the panes of glass to fail. Solar screens actually benefit the window by shading the window from the outside, which makes solar screens the most effective window treatment on the market today, bar none. Solar screens also help keep your home warm in the winter by acting as a “thermal blanket” around your windows (much like storm shutters) by keeping most of the cold winter breezes away from the window. Unlike most any other window treatments such as blinds, drapes, shutters, curtains; solar screens do not need to be opened or closed to derive the benefits, they work 24 hours a day, 7 days a week, 365 days a year without ever blocking your view. Q: Is there any maintenance involved with solar screens? A: Usually, a simple rinsing with a water hose will clean your solar screens. If you encounter something requiring more cleaning power, a soft window brush and some mild detergent should do the trick. Just make sure all the detergent is removed, to avoid build-up. 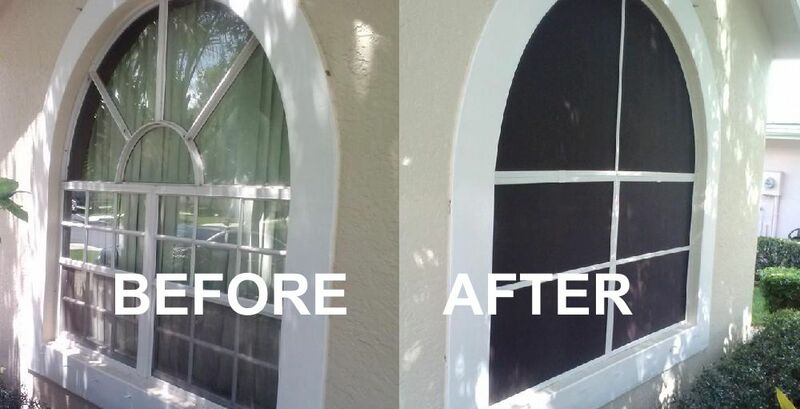 For a nominal fee Bruce’s Cool Sun Screens will inspect, tighten and clean your screens. A: Bruce’s Cool Sun Screens carries full general liability insurance and will gladly have our carrier forward a copy of our insurance certificate at your request. 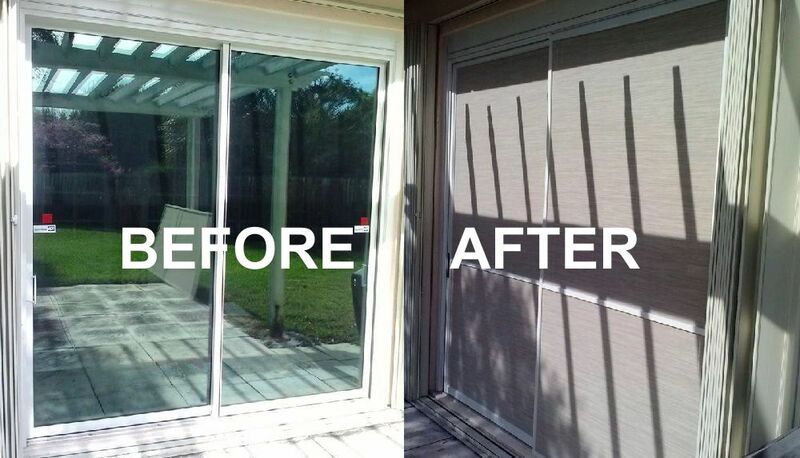 Currently a license is not required in Florida to fabricate and install sun screens. Q: There seems to be an excessive amount of heat in an area of my house where there are a lot of windows. What can I do to keep heat from entering my home through these windows? A: The best way to dispel the heat is to block the direct solar radiation before it gets to the window. You can do this with exterior shade created by a tree, fence, trellis, awning, shutters or solar screen. A solar screen absorbs solar radiation outside before it reaches the window.